Please refer to our stock # be865r when inquiring. 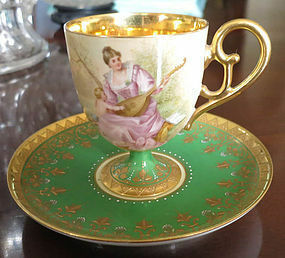 Handpainted pedestal cup and saucer with a woman with a cherub playing a mandolin. There is another cherub painted on the back side of the cup. There is the behive mark on both cup and saucer, and the bottom of the cup is marked "Musik." It is in perfect condition with no chips, cracks or repairs, and the gold is also perfect.